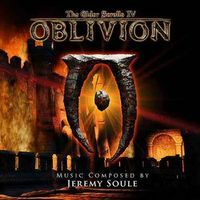 Oblivion's music was composed by Jeremy Soule, and is available from iTunes and was previously available from Directsong. If you have the PC version of the game, you can find the music files in the Oblivion\Data\Music folder, divided into 5 sub-folders depending on where they are used. They do not have the descriptive track-names and ID3-tags you'd get by purchasing them from Directsong, but are otherwise identical. The music varies from slow, "exploration" themes to faster, "battle" themes. It is often easy to tell when an enemy sees the player character because the music will change sharply. Special: These tracks are played at special times during the game. See Notes for more information. Explore: All of these tracks are randomly played one after another while the player is in the countryside (outside cities and dungeons). Public: All of these tracks are randomly played one after another while the player is in a city, inn, house, or chapel. Dungeon: All of these tracks are randomly played one after another while the player is in a dungeon (Ayleid ruins, caves, forts, mines etc). Battle: All of these tracks are randomly played one after another while the player is under attack. It won the MTV Music Award for Best Video Game Score and the Official Xbox Magazine's Soundtrack of the Year. The score was also nominated for a British Academy of Film and Television Award, losing out to Tomb Raider: Legend, and for the Outstanding Achievement in Original Music Composition award of the Academy of Interactive Arts & Sciences, which it lost to LocoRoco. Jeremy Soule stated that while composing the music he did not imagine any specific characters or events; rather, he wanted it "to comment on the human condition and the beauty of life". In a 2006 interview, he related that this desire came as a result of a car accident that occurred during his composition of the score. He said, "I ended up rolling in my car several times on an interstate while flying headlong into oncoming traffic ... I felt no fear ... I simply just acknowledged to myself that I've had a good life and I would soon have to say goodbye to all of it in a matter of seconds". Soule sustained only minor injuries, but commented that his feeling during the crash—"that life is indeed precious"—remained with him throughout the rest of the composition. In 2009, the Czech Philharmonic Chamber Orchestra & Kuehn's Mixed Choir released an album called "Play! A Video Game Symphony" that consisted of orchestral versions of video game soundtracks. 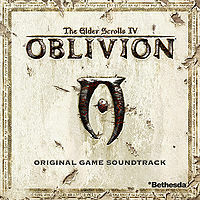 A nine-minute medley consisting of Reign of the Septims, Glory of Cyrodiil and Watchman's Ease features as track 11. The orchestra took the music on a world tour, including an April 2010 performance in Eugene, Oregon, which was attended by Jeremy Soule himself. The track "Auriel's Ascension" is not included on the original Xbox 360 version of the game. However, it is included on the PC and PS3 versions and the GotY edition of the Xbox 360 version. A slightly different version of "Reign of the Septims" is used for the game's introductory cutscene. A section of "Reign of the Septims" is used in The Elder Scrolls: Legends for Chaos Arena loading screens. Wes Johnson, the voice actor for Sheogorath, hums along. Not all places play the expected type of music. For example, an "Explore" tune is played in the Cheydinhal Fighters Guild Hall even though it's in a city. A "Dungeon" tune is played in the basement of The Oak and Crosier even though the upper floors use "Public" music. All tracks have significantly shorter playtimes than the ones listed above. The last few seconds are blank. This is most likely to break up the tracks in-game and give the player's ear a rest before moving on to the next track. The track "Through the Valleys" is a reworking of Morrowind's "Silt Sunrise". There is a track called LauncherMusic in the Oblivion folder which is the music played when the launch menu opens. The track is a sample of the 44 last seconds of "Reign of the Septims". ^ Jeremy Soule Interview & PLAY!